'Convert Image to PDF' is a simple to use, yet sophisticated file conversion utility specifically designed to convert images into PDF files. Supports up to 20 different image file formats including JPG, TIF, BMP, and GIF. Batch able. Fast, accurate and easy to use. 'Convert Image to PDF' is a simple to use, yet sophisticated utility specifically designed to convert images into PDF files. 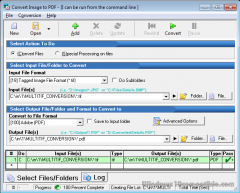 If you need to convert one or thousands of varying image file types into PDF, this is the tool. The most popular task our customers perform is to convert TIFF to PDF and JPG to PDF. 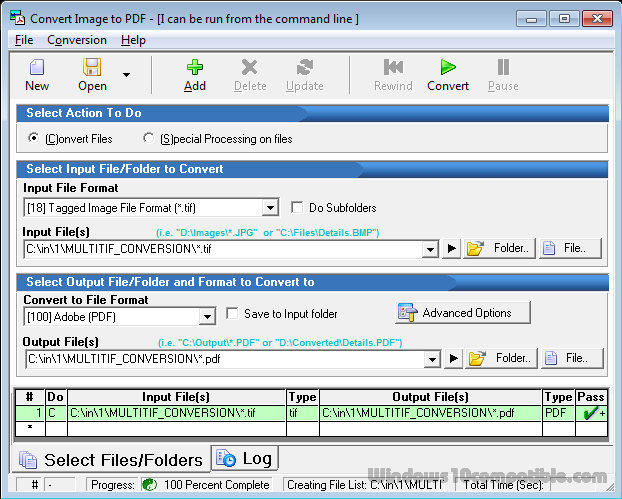 'Convert Image to PDF' can be especially useful if you require complicated conversion jobs to be done on a regular basis. By saving and recalling a conversion job file, 'Convert Image to PDF' quickly remembers all the conversion tasks and their details. All of our conversion tools have numerous features. For example you can schedule a conversion job at a regular interval (time or calendar based) while optionally moving/deleting the input files. Also, our conversion tools have the ability to launch other programs and perform file operations. 'Convert Image to PDF' can be run from the command line allowing for use of batch files as well as being automated from other programs. It also can be easily launched from the Windows Explorer shell by right mouse clicking on any image file. It's the best image to pdf conversion tool you've never tried...till today!